I was invited to join Bob Buchanon and his team to go and work in the Philippines for 19 days. It was a true joy to be a part of the group. We were with 9 Christians. Dear guys, it was a joy to work and travel with you, it was a very memorable trip. The other team members came in 6 hours later, I had booked a hotel, rested there till I was picked up at about midnight. I was picked up by Christians from the Kapitbahayan church in Manilla, who had picked up all the other team members from the airport and together we drove to B-01. B-01 is the name of the place where we stayed during our trip. B-01 is the home of the Cruz family, this is a large family, and most off the family-members live in this house. The mother, Delores, and five of her children with husbands and wives live in this house. And room was made for us to sleep. Thank you Cruz’ family for your love and care for us. You served us well. The food was wonderful and your hospitality was Christ-like. Our first day was a free day. In the morning we walked around in the area of B-01. In the afternoon we went to a large mall, to walk around and did some shopping. This day we started a meeting with the church at Kapitbahayan lectureship. The meeting was for three days and the topic was “The 17 divisions of the Bible”. On the first day I was assigned the topics, “why is the old Testament old” and “the Patriarchs”. This first day lasted from 8.00 in the morning till 21.00 at night. It was great to hear all the different lessons. Our second day of the meeting. I spoke on “the divided kingdom and Judah alone”. This day started at 8.00 and ended at 18.00. We started early, 7.30 and went through 20.00. They were long days, but very fruitful. I spoke on “the early church”. At 16.00- 17.30 the Kapitbahayan church host a radio program. We were invited to join in. Bob, Thailer and Justin were all part of the question and answer period. We had many questions. Questions as to what would happen to the present heaven and earth, questions on the vanishing of the Old Testament, questions on the title reverend, and several more. Sunday, we had a Bible class at Kapitbahayan, then worship. We left right after worship to travel to the island of Mindoro. We had to drive three hours to the ferry, then on the ferry for two hours and then another hour to the home of Eliseo Sikat and his wife. I had been with them three years ago, and it was great to meet them again. We arrived at about 18.00, we had a short visit and then started our classes. We would be with the group, meeting at the meeting place that is on Eliseo’s property for three days. That night we had two sermons, I spoke on “a message from Ecclesiastes” and Justin spoke on “friendship and spiritual love”. 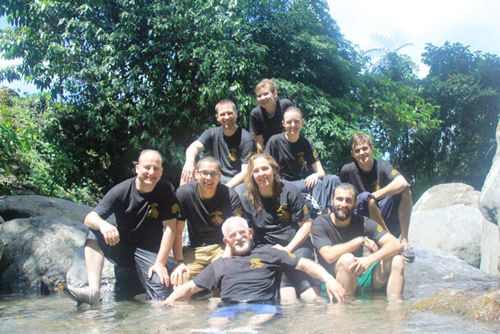 At the close of the meeting that night, two souls responded to the gospel call and were baptized in the river. Flashlights made it possible to see a little of this happening. The second day of this meeting was extremely hot. I spoke twice, “a true friend” from Isaiah 9 and at night I spoke on “judging”. After the message at night we had two more responses to the invitation. They were also baptized in the nearby river. In the morning we had four sessions. We had the afternoon off and went with a whole group, about 30 Christians to a waterfall and enjoyed some good food and after that we went to another place to see a great dam. That afternoon I got a little sunburn. At night we had two lessons, I spoke on “three sources of fear”. 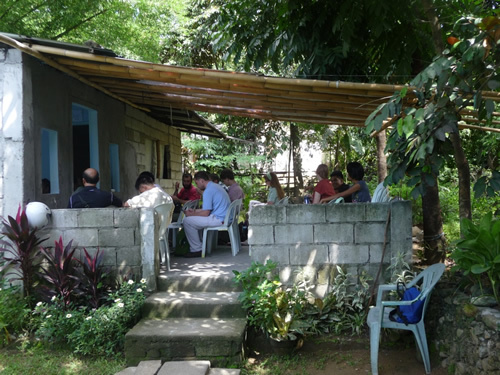 And so we closed the meeting with the church that meets at the property of Eliseo Sikat. Eliseo and his wife were wonderful host for us. Together with their daughter Esther and her husband Dell they made us a wonderful stay. We took off really early in the morning, we had to catch the ferry at about 6.00. We left home at 4.30 in the morning. It was a wonderful day, but very warm. 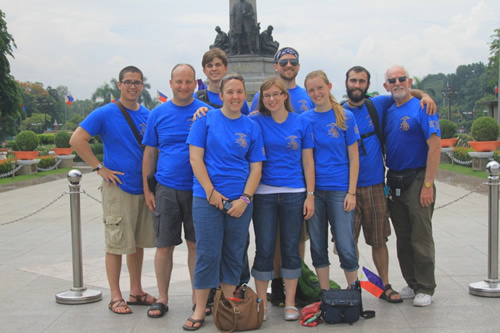 That day we met with the church at Canlubang, Edwin de Pedro works with this group. I had the opportunity to speak on “the blessing of meeting together”. We also had a question and answer period with this group. That night we stayed in a hotel in Manilla. We left early in the morning from the hotel. We took off to the church that meets at the home off Enfren Algaba, I spoke on “confessing sins to one another”. In the afternoon we went to a high school and taught two classes. 400 children in the age 12- 18. This was a wonderful experience. Thailer and Bob spoke on this occasion. After that we went to see the twin falls, beautiful waterfall in the area where Enfren Algaba lives, and after that back to B-01. That night we met again with the church at Kapitbahayan. We had two lessons that night. We started early to visit the place of Vicente Cay and the church that meets at his house, in the morning. I spoke on “the city of God” a lesson from Psalms 48. After the lessons and question and answer period we had a baptism. A young man responded to the gospel call. In the afternoon we met with another church. It got to be quite hot that afternoon, it was so hot that the projector stopped working. After this meeting we went back to B-01 and got home at 18.00. We went to a congregation with deaf members. Four of the team members presented lessons from power point. It was wonderful to be with them and to see their commitment to the Lord, in spite of being deaf. It was a very hot day. After the lessons we took two people to the local swimming pool top get baptized. After that we went back to the church at Kapitbahayan to do the radio program. Thailer and myself took all the questions that were asked. We had many questions again. Questions on the millennial reign, some on prophesy and prophesies, questions on Matthew 5: 17-18 and questions on the law of Christ. It was a wonderful experience to do this. Went home to B-01 and after went back to the church. We set in on a lesson presented by one of the younger members of the church and he presented thoughts on “five ways for failure”. My lesson was on “protecting our faith”. At 10.30 we left the church to visit with churches in two prisons. The first one was in a medium security. A group of about 35 inmates gathered with us. Bob and Thailer spoke. Three people responded to the gospel call. Since this was in prison, the ones responding could not be baptized right away, it had to be arranged at a later time. Then we went to a minimal security for another worship service. Another two lessons, Justin and myself spoke. I spoke from Psalms 19 and focused on how God shows his handiwork in creation. One man responded to the gospel call. He also would be baptized at a later time. Early start. We went to the church of Elijah Sikat. I spoke on “zeal without knowledge”. 5 sessions, good attendance and a question and answer period. We went to the home off Mel Tacbad and the church that meets at his father-in-laws place. It was a blessing to be with them. I got to speak on “Ananias and Saphira”. It was such an encouragement to be with Mel and the church, a wonderful family and church family. Mel is handicapped but loves the Lord and works tirelessly for the church. It was independence day in the Philippines and we had a day off. We went to a park in Manilla and spend the day there. Waterworks, fireworks, several other things to do. We got up at 5.30 and left the house at 7.00. We travelled to the church at Quezon Avenue and Ethan and Justin got to speak. It was wonderful to be with them. Then from there we travelled to Bayugo and the church that meets there. I got to speak on the theme of “three blessings of a godly man”, taken from Psalms 34. From there we travelled to B-01 and had our last night with the church at Kapitbahayan. I got to speak on the topic of “faithfulness”. When the meeting came to an end, we all said our goodbye’s to the church. 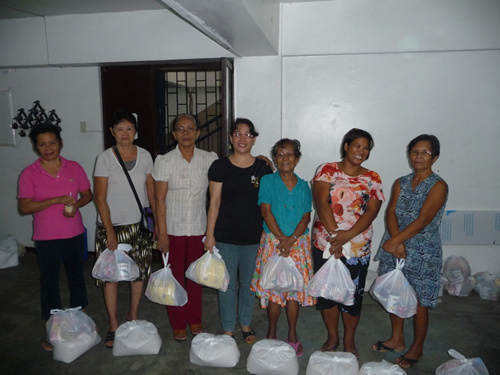 After that we had arranged that we would make a supper for the members of the church at Kapitbahayan. And so we did. Our night ended at about midnight and from there we went home, packed our belongings and in the middle of the night went to the airport. We arrived there at about 5.00 in the morning, the crew from the States flew out at about 8.00 and I was to fly out at 19.30. I took a hotel near the airport and slept during the day. I arrived safely at Schiphol airport at 7.30 in the morning. I was picked up by one of the members of the church in Haarlem and he took me to my car that was parked at the house of Jim Krumrei, evangelist in Haarlem. I got home safely at about 12.00.